Hi fellow campers, please check out my Fortnite Survey Form. I’d like to hear what you have to say. I will review your project in return should you desire as well. Thank you! Hello! YOu are a gamer :D? You see radio and checkbox buttons are so tight to each other, and it’s very hard to read page content, same selecting element. About the design ,I think having a white background with black text looks better than current black bg and white fg. Same i think the background colour is a little too much transparent, I suggest give it more alpha. Combobox comes without any disabled and selected option, please add. Textarea comes without placeholder, please fix. I think submit button is a little small, make it more sharp and bigger. I suggest apply the same style you added for text fields for combobox and textarea too, to sync your work design. Overall looks good, I think you did a great job. Fix the issue and it’s superb. All I talked could be found more in detail with code samples and more explanation on this survey form challenge walkthrough article, you may have a quick read. Like to see some updates soon, keep going on great work, happy programming. @NULL_dev, Wow so much great constructive feedback, very much appreciated! Most if not all of your suggestions have been addressed. I agree the major fix needed was the two column layout for input fields in mobile view and the background-attachment suggestion was perfect. I looked at your walkthrough article to fix the select/combobox issue as well, it’s very thorough and useful! I prefer the dark background with white font, so I added a bit more alpha to background for a bit more contrast. Thank you again, I hope it is more polished now. Btw, Fortnite is a popular battle royale game these days, check it out it’s free to play! The opacity of the survey is too much to the point where i can look through and be distracted by the background image. 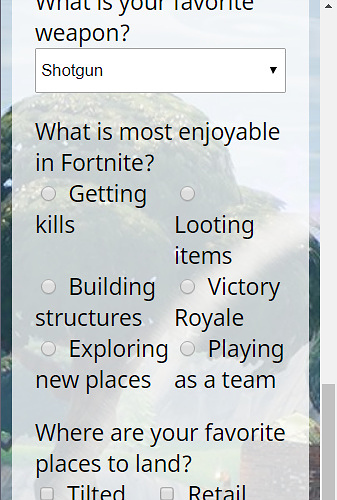 Make the survey bigger and bolder (along with the font size) to drive attention to it more rather then the background. @dsoliver18 Those are tips on improving one’s own gameplay and strategies, this survey form is meant to ask for an individual’s personal preferences and suggestions. @michaelnicol The form background is a bit darker, making the text more readable against the overall background. You guys think I should make this a fully functional form where users can submit real data and get the pooled results? Its fine, you will learn more about that stuff later on in FCC. Looks good, I would add cursor: pointer; to the submit button.